Luminous FLASH works most effectively on red backed cards and even though luminous filtered sunglasses must be used to read the marks, it is highly recommended that the user be experienced reading traditional Juice marked cards. Even though Luminous FLASH includes enough filter to gimmick 30 pairs of YOUR sunglasses. It is HIGHLY recommended that the customer also purchase the optional Luminous Enhancing Sunglasses, in order to make the marks easier to read, under a wider variety of lighting conditions. You will not require filtered sunglasses to read regular (non-luminous) FLASH marked cards. However, practice will be required and it should be noted that, generally, FLASH is more difficult to read than Juice marking patterns. Therefore, all FLASH marks should ONLY be used by experienced customers. Your average cost is $9.00 per marked deck when you purchase a "FLASH Dust (TM)". Each FLASH Dust (TM) jar should mark between 15 - 30 decks of cards depending upon the size and intensity of your marks. FLASH should only be used by advanced customers who are experienced reading Juice marked cards ! Beginners will, most likely, get frustrated. Very deceptive, and will likely fool those people who are only experienced with Juice technology. One jar of FLASH Dust (TM), instructions to apply FLASH to cards and tips on reading FLASH. While the optional JUICE ENHANCING SUNGLASSES can make learning to read FLASH faster and easier, FLASH is still more difficult to read than Juice. Juice Enhancing Sunglasses are NOT REQUIRED. But, they may be worn in public and act as a "aid" to make juice marks easier to read. Verified and confirmed PayPal users, please select one of the options in the 'pull-down' menu and then click on "add to cart". 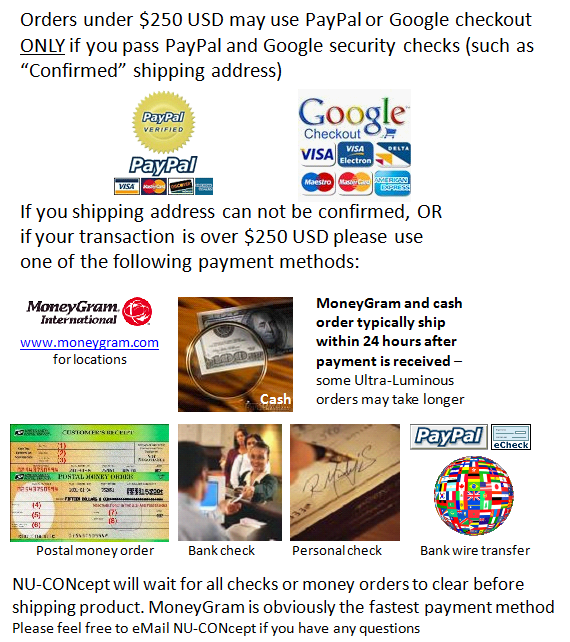 All other customers, please use one of the payment options listed below.